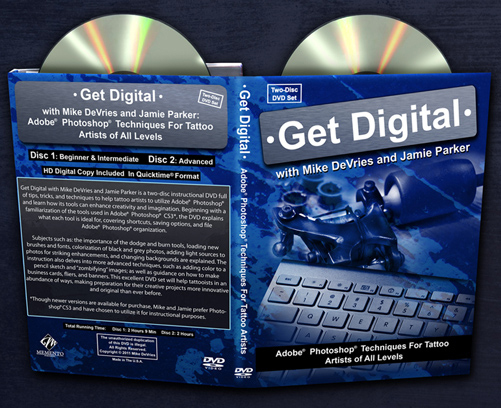 Get Digital with Mike DeVries and Jamie Parker is a two-disc instructional DVD full of tips, tricks, and techniques to help tattoo artists to utilize Adobe* Photoshop* and learn how its tools can enhance creativity and imagination. Beginning with familiarization of most of the tools used in Adobe* Photoshop* CS3*, the DVD explains what most tools are ideal for, covering shortcuts, saving options, and file organization. Subjects such as: the importance of the dodge and burn tools, loading new brushes and fonts, colorization of black and grey photos, adding light sources to photos for striking enhancements , and changing backgrounds are explained. The instuction also delves into more advanced techniques,such as adding color to a pencil sketch and "zombifying" images; as well as guidance on how to make business cards, fliers, and banners. This excellent DVD set will help tattooists in an abundance of ways, making preparation for their creative projects more innovative and original than ever before. *Though newer versions are available, Mike and Jamie prefer Photoshop* CS3 and have chosen to utilize it for instructional purposes. We don't cover every tool in Photoshop*, we just go over what we think is important for tattoo artists!